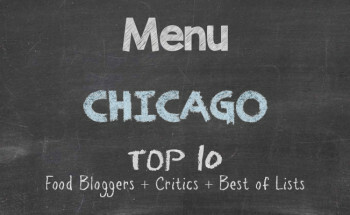 Now that summer is in full swing, I have been rather busy and that has cut into a lot of the free time that I had been devoting to food discovery in Chicago. And with the constant threat of thunderstorms on top of the heat and humidity, I had not been outside except for going to work. However, I gave in to my appetite and resumed my hunt for culinary satisfaction. In keeping with my jaunts, I ventured to the far northwest neighbourhood of Norwood Park to N.O.K. 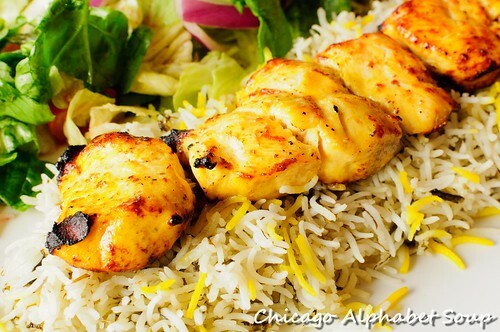 Fine Persian Food at 6075 N. Milwaukee Avenue. Unlike Noon O Kabob, which is the sister restaurant to N.O.K., there is no table service. You order at the counter and then take a pick of seats. Playing it safe, I ordered the joujeh plate for a main dish and bamieh with Persian tea for the finale. 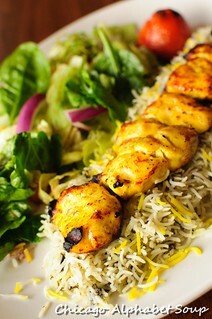 The joujeh were tender cubes of chicken breast served over Persian rice with salad. Each bite was an explosion thanks to the chicken being juicy, but without being undercooked. 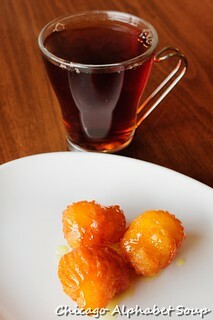 The bamieh were little doughnuts that had been accented with honey, very rich, and extremely delectable. Accompanied with a glass of Persian tea, they were perfect as a wrap-up for a Saturday afternoon lunch. One thing I noted upon entry at N.O.K. was that there were other Iranians in the restaurant. If you want to know exactly how authentic the food is, pay attention to the patrons. If there are others representative of the ethnicity in the restaurant, chances are they are regular customers who enjoy flavours from home. Although there is no table service, the service from behind the counter is very relaxed and accommodating. During my first visit to Noon O Kabab, I was blown away by the welcoming atmosphere and outstanding flavours. Well, the sister restaurant N.O.K. 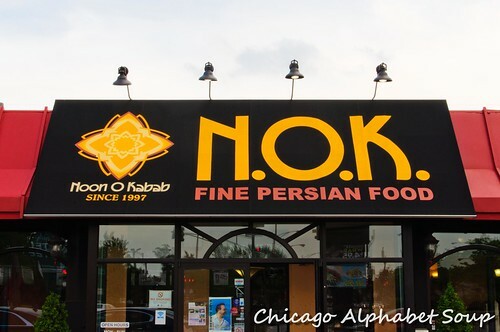 is proof that there is consistency in the Persian/Iranian eateries in Chicago.